At the beginning of our implementations at Stelligent, we perform a project, program or organizational discovery so that we have the means to make a before and after comparison. There’s no point in making an investment in this kind of change without a way to demonstrate how the change impacted the team. We have a tool that we’ve created called a cloud delivery scorecard. The scorecard manages questions and answers, provides recommendations and provides a means of comparison across industries. Moreover, there’s an automated subsystem of the scorecard that we hook up to our customers’ AWS accounts and cloud delivery components to provide a real-time analysis of certain attributes that indicate their ability to perform cloud delivery. We provide this tool as a free service to our existing customers. You can go to scorecard.stelligent.com to get a list of the questions we ask along with some example screenshots of the recommendations and the real-time indicators our customers see. If you don’t want to use the Scorecard, we’ve provided some sample questions that we ask of project stakeholders. Which version control repository do you use? Is 100% of the sensitive environment data separated and in a secure environment such as a database, directory service, etc.? Is the entire software system versioned at all times: environment, data, source files, configuration? Is the protected configuration data versioned with the rest of the software system/application? Is anyone able to spin up a complete new (demo) environment in less than hour using the infrastructure? Which storage mechanisms are being used? What types of files and/or data types are managed on these storage mechanisms? Which ports must be opened inside your network? Which ports must be opened outside your network? Which firewall software is used? How are switches used to restrict external access? Which applications use SSL and what are the domains? What is the process for requisitioning hardware? When new hardware is required, approximately how long does it take to procure it? How do you guarantee that OS and application servers are consistently configured across tiers? Which applications are installed on the various hardware instances? Provide the application name, directory location, version, URL, etc. Which software is used to run these applications? Are teams able to perform centralized remote deployments to different target environments? How do you handle duplicate dependencies between projects (i.e. dependency management) (Ivy and Maven are examples of tools that support centralized dependency management)? How often do developers checkin all their code to repository? How many times a year do you release software to users (on average)? How many target environments per pipeline (i.e. project)? Is there a suite of products released at once or do you release by product?Which development methodology do developers use? Is there a process for requisitioning hardware and managing deployments? Which build tools are you using? How many projects are there in your organization? Are you leveraging cloud computing? If so, how? Does your build/deploy process automate 100% of all aspects of deployments? Are all teams in the delivery process (dev, dba, qa, operations, etc.) using the same script or set of scripts? Are 100% of the provisioning scripts to create environment instances checked into the version-control repository? Which teams modify project build scripts? Which teams modify project deployment scripts? Which teams modify environment provisioning scripts? Are your environment instances “disposable”? Are automated unit tests run with the automated build? Are automated component/integration (e.g. database) tests run with build process? Are automated functional tests run with the build process? Are automated load and performance tests run with the build process? What kind of documentation does your build generate? Are you using virtualization? If so, which tool(s) and how? 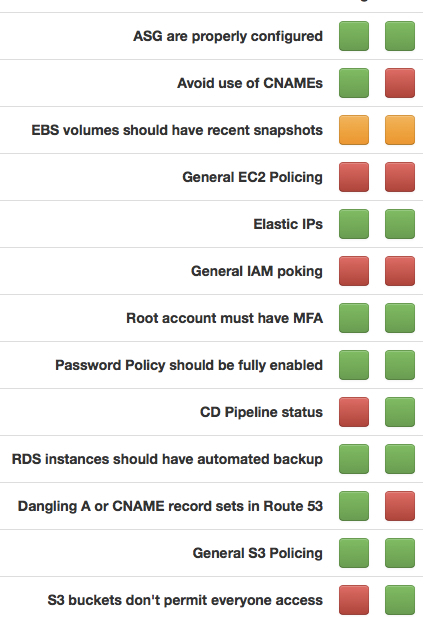 Are your builds utilizing any of the following static analysis reports? When target environment are provisioned, does it require someone to configure each of these environments or is it one click? Is there a QA team and/or are they paired w/ development teams? Is there a separate Systems/Operations team that manages deployments? Are DBA’s separate from development teams? Are there particular security restrictions with certain environments (e.g. developers can’t modify certain machines, etc.)? Is all the source code, configuration, data and host environment (everything to provision, deploy and build software) checked into the version control repository? What’s the typical lifespan of a defect? How many total hours are spent on deploying software internally (before it gets to production) for each release? Is there a process of build promotion (i.e. from DEV to QA, etc.)? Are you able to automatically rollback (or click a button) a software release? How often does the entire delivery team have retrospectives to discuss process improvements? Do the deployments run an automated smoke test to verify a successful deployment? Is any authorized team member able to perform self-service deployments? Is the instance creation (i.e. provisioning) 100% automated and headless (can be executed without a human)? Which database(s) are your teams using? Does your automated build/deploy process perform database integration and upgrades? Are ALL SQL scripts (DDL and DML) checked into version control repository? How do you make sure all required database scripts are run? How will you know the current state of the database to figure which scripts need to be run. How do you make sure that scripts are not run more than once? How do you make sure database scripts do not change between builds to different environments? If applicable, which database upgrade tool do you use (e.g. dbdeploy, Liquibase or other)? How do you connect to various hardware and software resources – passwords, private keys, etc.? Provide the location for various credentials to access these hardware and software resources? Are you able to track the precise cost of each hardware/virtual instance in use, in real time? If so, how? Are you able to track the precise purpose of each hardware/virtual instance in use – in real time? If so, how? Are you able to track the precise utilization of each hardware/virtual instance in use – in real time? If so, how? Where do you manage your software licenses? How do you manage your software licenses? Where do you track the relevant license information? Which resources are backed up? How often are these resources backed up? What’s not being backed up? Has there ever been the need to recover once something goes wrong? What is the process for recovery when something does go wrong? How often do you test this recovery process? How do you track defects and other issues on projects? How do you develop and share schedules or plans on projects? Is the provisioning of new environments on-demand? Is the provisioning of new environments self-service (i.e. users (e.g. developers) do not need to go through a separate team to assist in the provisioning of the environment)? Is any authorized user able to determine the cost of each instance, in real time? How do you account for future capacity? Can transient instances be terminated by an authorized user without contacting anyone else? Show list of questions along with results and recommendations from these questions? Are all provisioning processes the same, with the exception of environment-specific properties? Are all provisioning processes the same across environments, with the exception of environment-specific properties? How many developers are there in the organization? Which language/technology platform? Java, .NET, Ruby/Rails, PHP, Other? Did we receive an organization chart of my area of focus that includes titles, areas of responsibility, who reports to whom, etc.? Is there a suite of products released at once or do you release by product? How many target environments per pipeline (i.e. project) Do you have separate Development, QA, Stage and Production environments? Which development methodology do developers use? Does your automated build/deploy process perform database integration and upgrades? An automated process that doesn’t include “export and import” of the entire database. Are ALL SQL scripts (DDL and DML) checked into version control repository? Can you recreate your database using only DDL and DML scripts checked into your version-control repo? What’s the typical lifespan of a defect? That is, what is the duration between discovering the defect and fixing the defect? Is the instance creation (i.e. provisioning) 100% automated and headless (can be executed without a human)? Are all steps scripted (or other) and checked into the version control system such that there are zero manual steps? Are you able to track the precise purpose of each hardware/virtual instance in use – in real time? Are your environment instances “disposable”? That is, is anyone on the delivery team able to perform a full deployment from a clean machine without installing other tools or performing manual configuration and generate working, testable software? Are you able to track the precise cost of each hardware/virtual instance in use, in real time? Are you able to track the precise utilization of each hardware/virtual instance in use – in real time? Is 100% of the sensitive environment data separated and in a secure environment (such as a database, directory service, etc.)? Is any authorized team member able to perform self-service deployments? Pattern: Self-Service Deployment. Select an environment, a revision number and click a button/type one command? Below, you’ll find a complete list of the typical deliverables in a scorecard/discovery. You might choose to only focus on the current scores against the patterns. At a minimum, the idea is to assess the current state so that the team knows what improvement looks like when it happens. Think of it as the “before picture” prior to entering a weight-loss program. If you choose to provide detailed recommendations, then this becomes the action plan in how to go about “losing the weight”.